To understand whether and how structural and functional networks mediate these processes. Planners: Lawren VandeVrede, MD, PhD; Bruce L. Miller, MD; Howard J. Rosen, MD; and Eleanor O’Brien have stated they have no relationships to disclose. 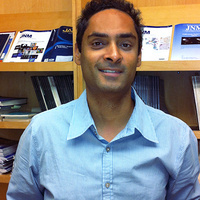 Speaker: Dr. Raj will note any disclosures at the beginning of his talk. Accreditation: The University of California, San Francisco (UCSF) School of Medicine is accredited by the Accreditation Council for Continuing Medical Education to provide continuing medical education for physicians. Designation: UCSF designates this live activity for a maximum of 22 AMA PRA Category 1 Credits™. Physicians should claim only the credit commensurate with the extent of their participation in the activity. The above credit is inclusive of all Memory and Aging Center Grand Rounds sessions offered January 2018 through June 2018. (1 credit per each 1-hour grand rounds session throughout the year). Grand Rounds presentations are for educational purposes and intended for a professional audience. This activity is not commercially supported.